of the subject and the area around it. ultra-high performance lenses from 210mm telephoto to 43mm superwide. 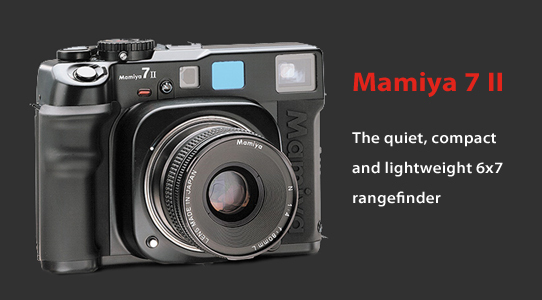 Mamiya 7 II’s rangefinder design also eliminates noise and vibration of typical SLR mirror movement, and coupled with Mamiya’s own silent and precise electromagnetic shutter, allows for quiet and unobtrusive work in any situation. You see the subject at the moment of exposure - without missing a heartbeat. Ideal for photojournalists and all candid photography. clients appreciate the large, detailed 6x7cm format over others. The Mamiya 7 II are designed to take 35mm film cassettes when the optional panoramic kit is inserted. It yields spectacular 24x65mm images, an aspect ratio of 1:2.7. The optional 35mm panoramic kit consists of a panoramic film mask, a cassette holder, film take-up spool and rewind crank set. It is easy to attach and remove. The Mamiya 7 II also have convenient and accurate built-in aperture priority AE (with 1/6 step increments), or completely manual metering with LED readouts. In both modes, +/-2 exposure compensation in 1/3 steps is possible. The AE system is able to provide excellent exposures for virtually any lighting situation, even with high contrast subjects. An AE lock is provided to give the photographer final exposure control. All shutter speeds can also be set manually on the camera’s shutter speed dial. In this mode the exposure meter can still be utilized by observing the LED readouts along the bottom edge of the viewfinder. Exposure compensation from +2 to -2 EV gives additional manual control to adjust for filters or to obtain certain desired effects. The built-in curtain, activated by a control on the bottom of the camera, permits lens change without fogging film. It locks if the lens is not securely attached to the body. Aftermarket manufacturers offer sophisticated, fiber optic plate Polaroid backs which can be installed in place of the roll film back door on the Mamiya 7 II and cameras by the photographer. Most photographers using this capability regularly find that dedicating a second body to the Polaroid back is the best method of operation, as the back door cannot be removed in mid-roll. Mamiya lenses are designed and built for today’s foremost photographers who expect their equipment to provide both outstanding and distinctive results. Engineers at Mamiya have developed rigorous performance criteria for each lens design. No detail is overlooked. No test is omitted. The goal is technical perfection...The result is a series of lenses which have set the new world-standard of performance. Each lens element is precisely polished and coated using Mamiya’s proprietary multi-coating process to increase light transmission, dramatically reduce flare, ensure crisp, clean whites and vibrant, yet natural colors. Mamiya engineers and inspectors test continuously as the lens is assembled to insure flawless quality. The result is a lens designed so carefully, built so meticulously, that it consistently renders extraordinary performance. It is Mamiya’s unique balance of extreme sharpness, brilliant contrast, accurate and consistent color fidelity and overall high performance that captures the imagination of contemporary photographers who choose Mamiya to express their personal visions. Among today’s community of world famous photographers, Mamiya lenses have established themselves as the new benchmark by which others are measured. The Mamiya 43mm f/4.5 is a true wide angle design that produces unparalleled results - with a maximum of 0.04% distortion at the corners. The 43mm f/4.5 opens up a new world of distortion-free ultra-wide angle photography. Supplied with ultra-wide optical finder. The detachable ultra-wide optical finder is used for composition. It features a built-in, adjustable diopter, rubber eyecup, and built-in spirit level. Applications include reportage, landscape, architecture and industrial photography. Equivalent to 21mm in 35mm format. Weight 14 oz. / 390 g.
This is a wide angle lens with a 68° angle of view. It is the most popular wide angle focal length in 6x7cm format. It renders natural perspective with increased depth of field and angular coverage and provides the least amount of distortion of the wide angle range for subjects at the edges of the frame. Applications include group portraits, wedding photography, and general purpose wide angle photography. Equivalent to 32mm in 35mm format. Weight 13 oz. / 380 g.
The Mamiya 80mm f/4.0 is a standard lens using a symmetrical design for exceptional performance. For the fast and spontaneous shooting style associated with rangefinder camera designs, the 80mm focal length is a logical choice as a wide-normal lens. Applications include general purpose, fashion, portraiture and landscape photography. Equivalent to 39mm in 35mm format. Weight 10 oz. / 290 g.
The Mamiya 150mm f/4.5 is a moderate telephoto, using a unique design of six elements in five groups, along with low and ultra-low dispersion glass to create apochromatic performance matched to the entire group of Mamiya 7 lenses. Applications include portraiture, fashion, landscape and aerial photography. Equivalent to 71mm in 35mm format. Weight 1 lb. 2 oz. / 520 g.
The Mamiya 210mm f/8 lens is a compact 17 ounce, 4.9 inch lens designed to meet the needs of Mamiya 7II owners who like travel, backpacking and desire a lightweight telephoto to capture distant landscapes. This lens in not coupled to the rangefinder, and must be set for the estimated distance of the subject. Applications include distant landscape and aerial photography. Equivalent to 105mm in 35mm format. This highly specialized Close-up Adapter for the Mamiya 7II is used exclusively with the 80mm lens at a single distance of 10.8 inches from the front of the close-up lens. It has a collapsible framing device that attaches to the tripod socket of the camera for fast subject positioning, or copy work. When using the adapter, the 80mm lens must be set at 1 meter for correct focus. The adapter disassembles for easy storage or carrying. Copyright © 2011-2013 Leaf Imaging LTD. All rights reserved.